Why bother with the fairs? We all know the criticisms. Overly commercial. Too conservative. Unrepresentative of what’s important about art. Superficial and pretentious crowd. And beyond all that, in photography specifically, there appears to be a predictable roster of blue-chip artists whose work is prominently featured in one booth after the other creating a déjà vu effect throughout the fair. But, there are good reasons to bother. Many galleries bring in brand new and exciting work not yet shown elsewhere, or shown only locally. Things that have not yet received wide attention yet come from fully developed bodies of work. Even if you aren’t there to buy – and most of us aren’t – art fairs can be valuable occasions for discovery. There were over twenty art fairs during Miami Art Week. I spent the week on a quest to find work by the living artists using photography among the sudden flood of neo-figurative painting that permeated the pavilions. It was heartening to see many galleries’ efforts to bring in the less easily defined and genre-pushing work. Sara Greenberger Rafferty, No Respect I, 2017 Acrylic polymer and inkjet print on acetate mounted to Plexiglas 29 x 23 inches. The New Art Dealers Association (NADA) fair was held at the historic 1923 Ice Palace Film Studios in Miami. Navigating through dark aisles I came across two booths displaying Sara Greenberger Rafferty’s work. 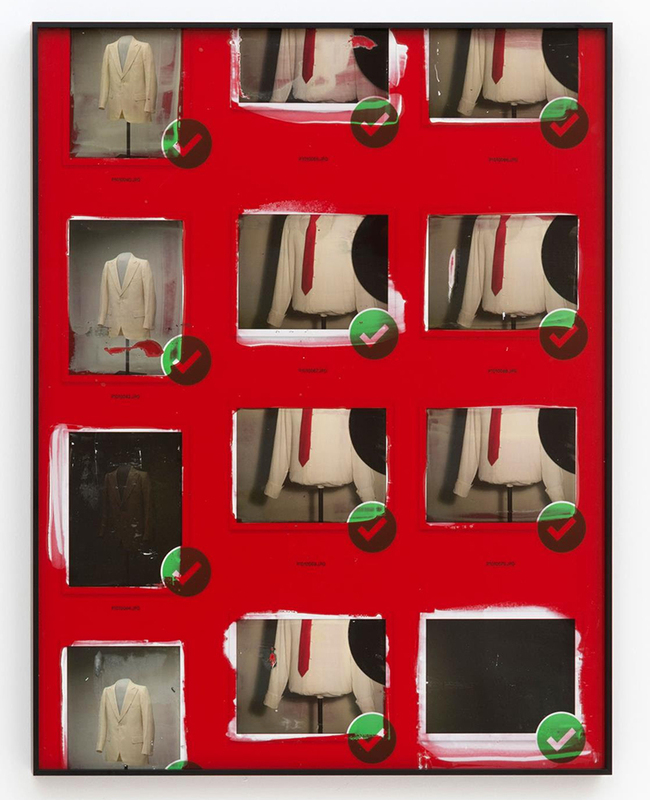 A glossy vermilion panel with pictures of a man’s shirt and a red tie in thumbnail-like arrangement with green Dropbox check marks at Rachel Uffner Gallery is No Respect I from 2017. The intensity of color and depth are achieved by scraping acrylic paint on the ink-side of an inkjet print on clear plastic film which is then mounted to a sheet of colored Plexiglass. The pictured shirt with tie is the comedy legend Rodney Dangerfield’s costume now on display at the Smithsonian Institution where the artist directed a photo shoot. The image is part of Greenberger Rafferty’s wider exploration of the themes of television and comedy. The people-less items of clothing and the layout of the pictures on the background feel like forensic photography suddenly gone awry. Further down the hallways at NADA I discover an equally theatrical new work by David Gilbert at Klaus von Nichtssagend’s corner booth. 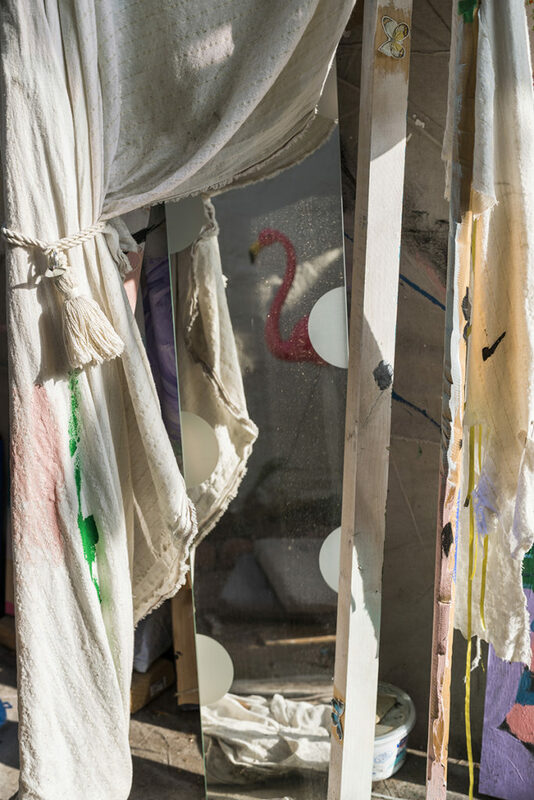 Flamingo, 2017 is a straightforward documentation of a dramatically side-lit arrangement of objects in the artist’s studio. A dusty mirror half-reveals the cheerful plastic protagonist of the piece peeking in from the background. Such elevated depiction of the cheap gauze drapery and other glorified studio junk in the still life is both ridiculous and poetic. More studio experiments at Yossi Milo’s booth at the Untitled fair in Miami Beach. David Goldes’ modestly scaled drawings from Electricities series are made on white paper, painted with layers of black gesso, then graphite is applied and burnished. Non-graphite areas are sanded and polished with steel wool Minimal and dark, the mysterious silvery pieces require intimate distance and closer inspection. Goldes burnishes graphite to a metallic sheen so that the geometric shapes in the drawings can carry electric currents. The electricity travels along the field of a drawing following its own trajectory, often burning holes in the paper and blackening the surface to impenetrable velvety soot black that barely translates to a jpeg. In Rawson Projects’ booth at Untitled I stumble upon works made in a similarly dark monochromatic palette and as scientific in concept if not process. 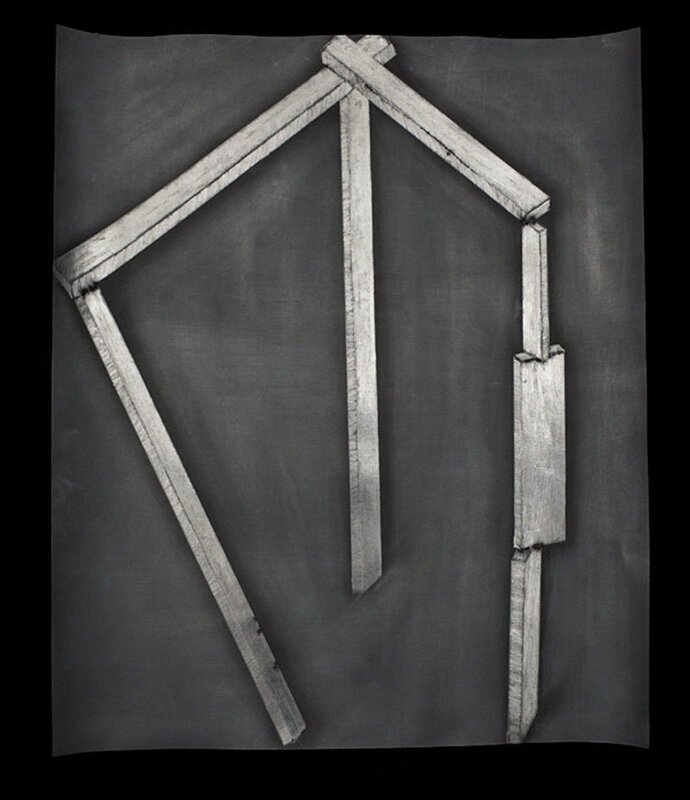 Leah Beeferman’s Monodynamics 2 references quantum physics theory that there is no such thing as pure nothingness, but that emptiness is filled with the energy of particles and antiparticles that sporadically appear and vanish. The artist’s images are both dense and open, a push and pull between the space and the matter within. 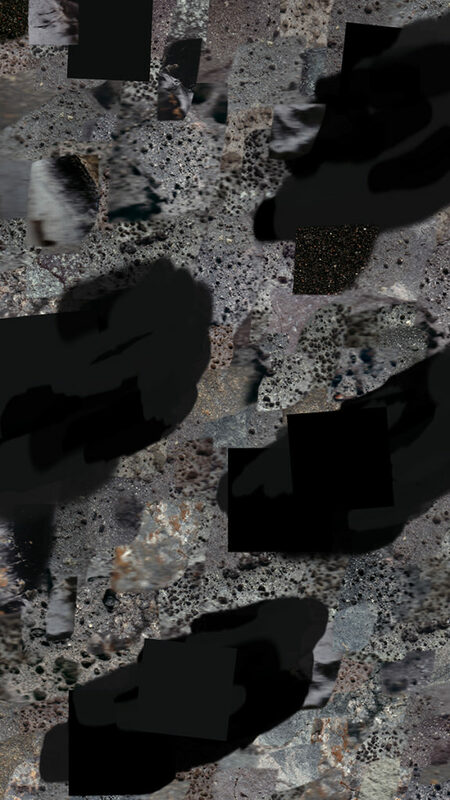 For Monodynamics 2, Beeferman used scans of volcanic lava rocks from Iceland. These were merged, fragmented and reassembled; a method illustrative of the artist’s thinking process about density, form, color and other properties of matter in the natural world. A hypnotizing interplay of formal elements and exquisite palettes characterize new works by María Martínez-Cañas, presented at the Kabinett section at Miami Beach Art Basel. 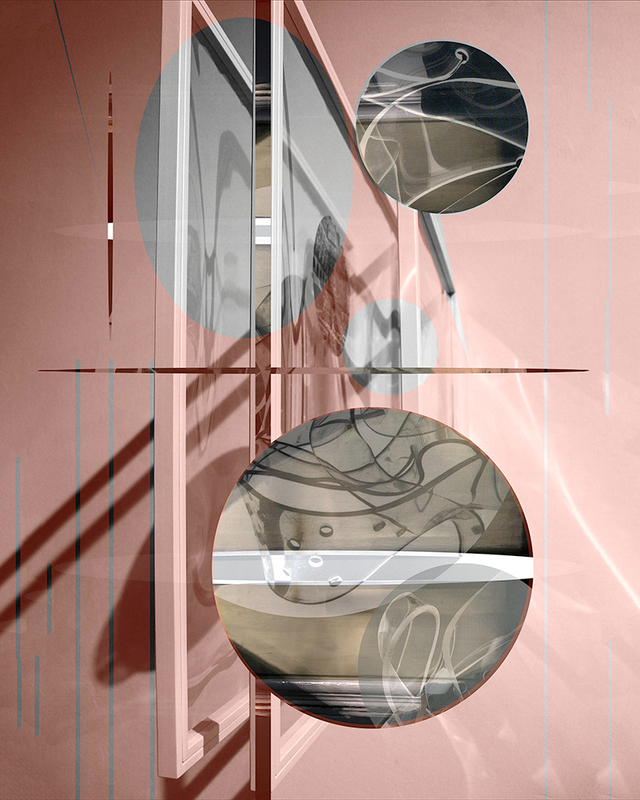 Among the pieces on display are inkjet and plexiglass printed images from her 2017 Estructuras Transformativas series. The pictorial space in these mesmerizing assemblages is comprised of clean geometric forms reminiscent of Constructivist experiments where light with its reflections and distortions acts as a foundation for the structure of the composition. The elements appear to be in perpetual motion within the frame of the image, in flux between flatness and dimensionality. More works from the new series will be exhibited in a solo show opening on February 10 at Julie Saul gallery in New York. David Hartt’s display at Chicago’s Corbett vs. Dempsey Gallery booth included a few ominous looking images from the artist’s in the forest series produced alongside his film of the same title. The photographs document the abandoned Habitat Puerto Rico project designed by Moshe Safdie in San Juan in the 1960s. 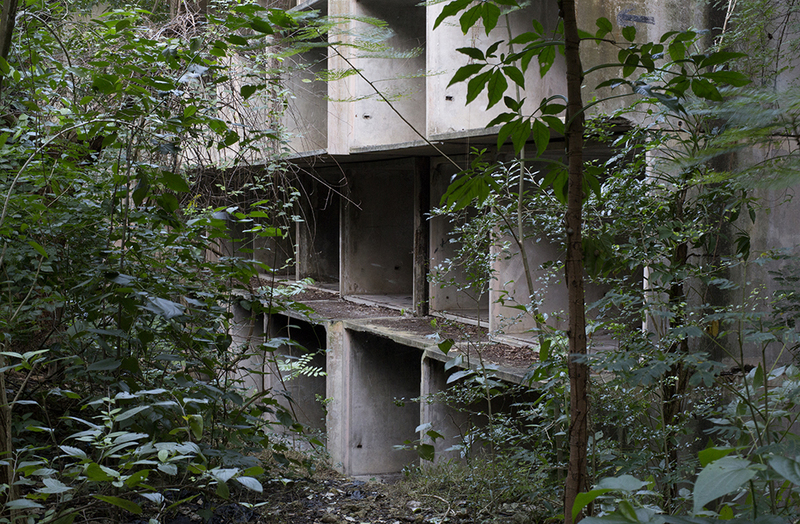 The geometric blocks of the unfinished and abandoned buildings stand in stark contrast to the lush foliage of the surrounding environment. The crumbling remnants give themselves up to the encroaching climbing vines of the magical forest. It is hard not to empathize with the nostalgic feeling of these quiet images. Another failed experiment in modernist utopia presented in somber unembellished form. A mysterious triptych by Willie Doherty at the Kerlin Gallery continues the legacy of the Irish artist’s photographic investigations of places charged with tumultuous political history. The emptiness within the central image of the triptych carries over onto the equally bleak desolate spaces to each side, physically stretching the uneasy and unspecified feeling that this grouping evokes. In Rose Marie Cromwell’s display at Prizm fair in Miami, the photographs from her years shooting in Cuba are installed in airy map-like pattern. The project El Libro Supremo de la Suerte refers to a popular Cuban book, which uses numbers to identify various events, experiences and objects. Many Cubans then use those numbers to play an underground lottery. Cromwell’s work explores the mythology associated with those numbers while serving as a record of the artist’s own search for photographic luck in a place she has come to know so intimately. 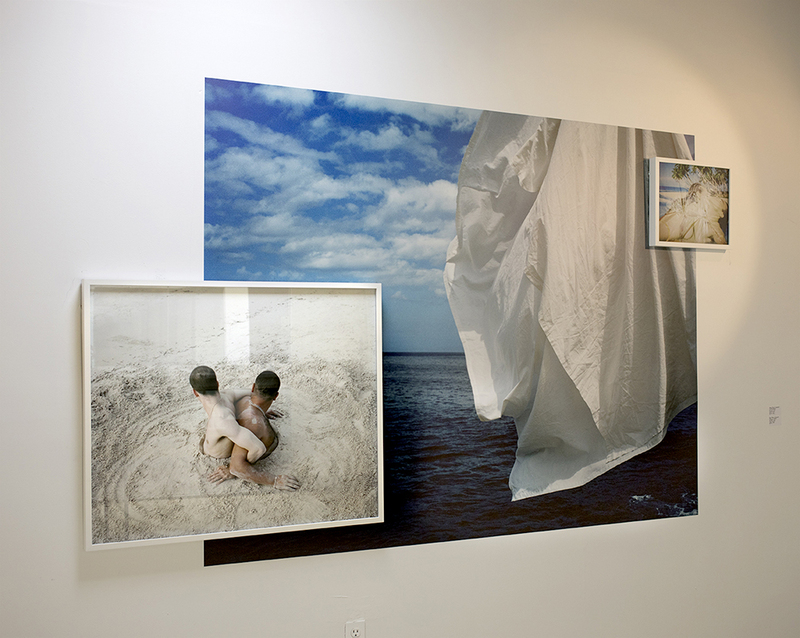 Rose Marie Cromwell, Installation view from the project El Libro Supremo de la Suerte 2009-2016.